New snow, strong winds and multiple weak layers have created dangerous avalanche conditions at upper elevations. Now is an easy time to make smart decisions, stay on low angle terrain and give steep slopes a wide berth. This new snow and wind slab will need time to come together. Strong caution is advised on all terrain above 5,000'. Most of the forecast region received rain over the past couple days. The rain in most areas has frozen into a firm crust on or near the surface. Once that crust gets more snow on it, it could be problematic. Rain crusts can make nice sliding surfaces. Let's hope the next storm comes in wet and turns dry. Wet snow will have a much better chance of sticking to that rain crust then a dry slab would. Heavy mountian snows and high winds are forecast for the coming week. This will further bury a layer of weak surface hoar and create touchy slab conditions. Expect this slab to thicken and become more dangerous as the week progresses! The lack of snow over the past week has given the layers of snow near the surface (storm slabs) a chance to strengthen. Don't let your guard down though...There are still 2 layers deep in the snowpack that can be woken up if triggered. Even though the snowpack is healing, it's still quietly near a tipping point. Don't get tempted to test mother nature right now. Keep a conservative approach to your terrain selection and keep your group in sight. This week has seen clear skies and gradual improvement in stability with another cycle of surface hoar development on the denser layer from the 12/30 storm (note: first hand inspection, this is not a full on rain crust). All the new loading of the past two weeks has buried the persistent layer under 2 to 3 feet of snow and even deeper in windloaded areas. Be cautious of this layer as a slide of this depth would be catastrophic. 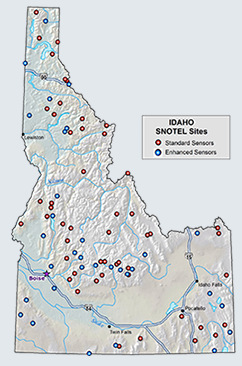 The Kootenai snowpack is becoming progressively stronger with moderate temperatures. Stay safe this weekend by practicing safe travel habits such as commiting one rider to a slope at a time, watching your parters and parking in safe locations where you will be an asset rather than a victim if your partners triggers a slide. The snowpack went through the ringer over the holiday weekend, recieving up to 2ft+ of snow and then some rain/mixed precipitation on top of that. Even though the snowpack is starting to heal and get stronger, there are multiple persistent weak layers that can be triggered causing an avalanche. Be conservatice in your decision making and route finding, dangerous avalanche conditions still exist but are slowly strengthening. The snowpack is beginning to heal after a to 2+ ft. deposit of snow across the region last week. Even though the snowpack is getting stronger, there are still multiple persistent weak layers that can be easily triggered causing avalanches. Be conservative in your decision making and route finding. There's plenty of good snowmobiling and skiing to be had out there if you choose your terrain appropriately. Dangerous avalanche conditions still exist but are slowly strengthening day by day. Heightened avalanche conditions exist at the upper elevations due to wind slabs from last weekends storm. At lower elevations multiple slab layers persist but are proving to be less reactive in stability tests. Stay safe by practicing safe travel habits as these more stubborn slabs can lull one into complacency by reinforcing bad habits and a false sense of security. Heavy snowfall has been and is currently falling and will continue throught the advisory period with snowfall rates up to an inch an hour. Avalanche activity is expected to increase during the advisory period. Storm slabs can be triggered easily by skiers. Windloading has occured on the SE - N aspects, with extensive windslabs and cornices observed at the higher elevations. Careful snowpack evaluation, cautious route-finding and conservative decision making are essential in the backcountry today. A winter storm has been dropping steady snow for the last 24 hours and is expected to clobber the mountains of NW Montana Friday night and into Saturday. Expect the potential for natural and human triggered avalanches to rise throughout the weekend as more snow and wind pour into the area. Stick to lower angle terrain and ridgelines until this new snow has had time to settle and bond. Remember rapid changes in weather cause rapid changes in snow stability. Red flags are evident with increasing and recent snowfall moderate to heavy, breezy and gusty winds, observed whumphing. With the continued precipitation and warming temperatures expect more weight and strain our persistent weak layers 2-3 feet down in the snowpack. Expect to see some natural avalanche activity and whumphing and cracking the next few days until things settle. The snowpack and its weak layers are gaining strength but still have the potential to fail and create large avalanches due to the thicknesses of this layer and the weak, sugary snow below it. The cold temperatures over the Holiday Weekend didn't help the snowpack stabilize much; there is still a likelyhood of triggereing a persistent slab avalanche. Carefully assess the snowpack and allow for a large margin of error when choosing terrain. New snow is expected tonight and tomorrow which will continue to stress the weak layers. Look for clues from the snowpack, shooting cracks, and localized collapsing. The snowpack and its weak layers are gaining strength but still have the potential to fail and create large avalanches due to the thicknesses of this layer and the weak, sugary snow below it. Keep in mind that most avalanche accidents occur on days when the hazard rating is considerable or moderate. Steady snow accumulation has been the rule for the past week but the 36 hour dump from Sunday night to Wednesday is what tipped the scales. We have two feet of unstable snowpack on top of the Thanksgiving crust and the most sensitive layer is within the 36 hour storm snow. You'll find it about 1.5 feet deep in soft new snow. It will take a little longer to become stable, especially in steep terrain. This weeks storms dumped 25 to 30 inches of snow, now burying the surface hoar and faceting that had developed on top of the Thanksgiving crust. This is providing an unstable layer underneath all this new white that is a potential trigger point for avalanches on slopes >30. This persistent weak layer will continue to be sensitive to triggers. Careful route finidng and conservative decision-making are essential for backcountry travel today. Heavy snowfall has been and is currently falling on our weak snowpack and will continue through the advisory period with snowfall rates up to 1" to 2" an hour. Avalanche activity is expected to increase during the advisory period. Windloading has occurred from the N-SE aspects, with extensive windslabs observed at the higher elevations. Careful snowpack evaluation, cautious route-finding and conservative decision making are essential in the backcountry today. A major winter storm has arrived and is dropping a large amount of snow on a very weak snowpack. Expect to see wide spread avalanche activity in the backcountry for the next 24 hours. We could see snow today falling at a rate of 1-2'' an hour with totals approaching a meter in higher elevations. Careful snowpack evaluation, cautious route finding and conservative decision making will be essential. Human triggered avalanches are likely on slopes above 30 degrees. We have received only a trace of snow this week with contnued cold weather, with more surface faceting and isolated areas of large surface hoar buildup in frost pockets sheltered from the sun and wind. The avalanche danger is rated LOW on all slopes with generally safe riding conditions other than the thin snowpack with many obstacles. HOWEVER......Heads up through the weekend with snow on the way covering weak facets and surface hoar abroad! The snow trends in the mountains are currently being driven by the inversion. Large surface hoar was found on all aspects below 5100' , with smaller hoar found at higher elevations. Near surface faceting found on all aspects. The pack hasn't changed much since Thursday with some melt freeze crusts forming on the southern aspects at higher elevations. Not a lot has changed with the weather or snowpack since the last advisory. The good news is... most area have a firm base of snow to help limit the amount of basal rotting that's typical during long spells of high pressure. The bad news is... the upper portion of the pack has 2 distinct weak layers and is not supportive enough to receive more snow on top of it. With not much snow recently or much in the future, the forecast area will remain at a LOW danger rating. The biggest area of concern would be above treeline on steep slopes. Loose snow avalanches are possible in isolated areas. Rain and warm temperatures over Thanksgiving had a toll on the depth of our snowpack. The newer snow is fairly well bonded to the Thanksgiving crust, but small windloaded pockets were observed on all aspects. Surface hoar and near surface faceting was also observed. Looking ahead at the weather forecast, no new precipitation is expected for a while and daytime highs over the weekend could form sun crusts. It's been at least 2 weeks since the Cabinet or Selkirk mountians have seen any new snowfall. The recent high presusure and colder temperatures have started to break down the snowpack (near surface faceting). In most areas the snowpack can be summed up in 2 parts. The bottom half of the pack is old firm frozen snow and the upper portions of the pack is light unconsolidated snow. 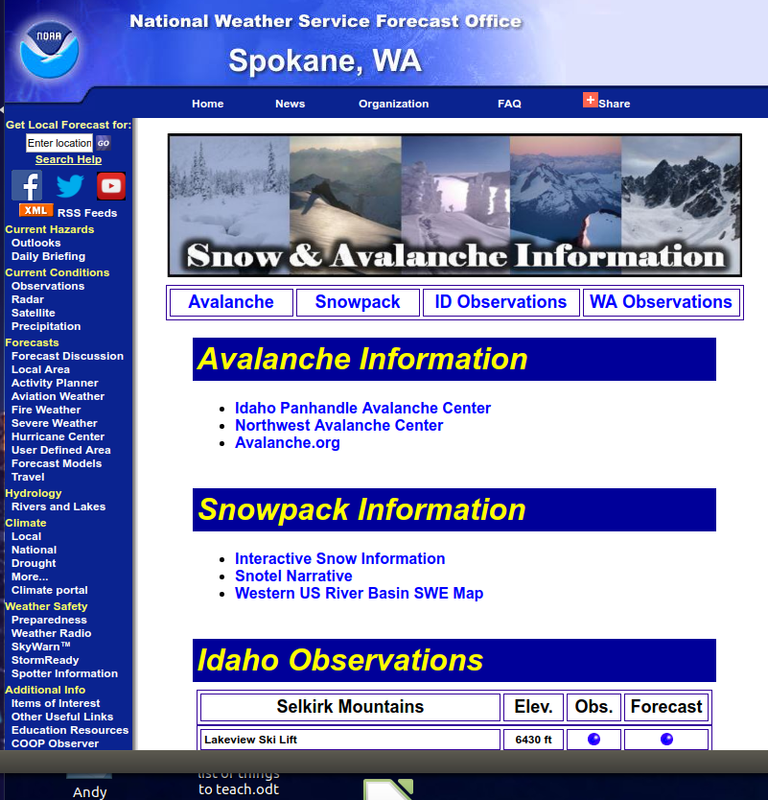 In it's current state the snowpack doesn't present much avalanche danger. For questions regarding these changes please contact Ben Bernall @ bbernall@fs.fed.us or call 295-4693. Avalanche advisories will be posted for the Kootenai National Forest begining December 1st, 2017. Advisories will be posted on Tuesday and Friday mornings. The NWS has issued a Winter Storm Watch for the northern portion of the Idaho Panhandle. Expect a cold front to bring heavy snowfall from Wednesday evening through Friday morning. Avalanche hazards could exist in high elevation avalanche start zones, especially on northerly aspects. Thank you to everyone who helped IPAC withour mission to provide avalanche education and post weekly avalanche advisories for the public. This year was one to remember with many great days in the mountains. There are still good times to be had so check out the Education page for Spring Touring/Riding Tips. Cheers! This will be the last advisory of the season. Check out our Facebook site later this afternoon for some spring snow tips! Thanks for following us this season and look forward to bringing you all more avalanche information next winter. Have a good summer! I hope you're all out enjoying the sunshine! The avalanche danger is on the rise while the sun is out. With these warm temperatures and solar radiation be aware of the possibility of wet avalanches. Solar aspects will be the most likely spot to find unstable snow. With todays sun and warm temperatures the avalanche danger is on the rise. Be aware of wet / loose avalanche activity, especially on solar aspects. Enjoy the sunshine! The supportive crust near the surface of the snowpack is breaking down quickly with the warm temperatures and rain. The rain percolating through the snowpack will break down some of the strength. Expect to see unsupportable snow in the backcountry. Human triggered avalanches are still unlikely but possible. Natural avalanches are a possibility especially on steep slopes with a smooth bed surface. Safe travels! The rain and warm temperatures have made an effect on the snowpack. Yesterday in the Cabinet mountains, we found the supportive crust near the surface layer mostly gone. Skier and snowmobiler triggered slides are unlikely but natural wet slides are possible. We did see a wet slide (D2) yesterday that covered the Tressle ck. road. The more unsupportable the snow the greater chance of seeing some avalanche activity. I was sure nice to see the sunshine yesterday! I dug a snowpit yesterday north of Schweitzer mountain in the Selkirks (6200ft). There is 30-40cm crust near the surface that is very supportive. I don't see the avalanche danger increasing until that thick crust gets broken down. Rain and warm temperatures might try to break down the crust layer but my feeling is that overnight temperatures will be cold enough to keep it intact for the extent of this forecast. The snowpack has gone isothermic. That means the temperature outside will be a good indicator for figuring out the avalanche danger. Right now freezing temperatures over night are keeping the avalanche danger low. An increase in temperature could increase instabilities. For now, enjoy the spring riding! Welcome to Spring! The snowpack in the Selkirks and Cabinets has gone isothermic. If we see an increase in temperature there could be an increased avalanche danger but right now overnight temperatures are cold enough to keep snow from moving. Temperatures are on the warm side and new snow is accumulating with westerly winds. Watch wind loading on lee aspects. Weak layers may form as changes in density new snow. The pack may be getting a little rotten and that increases your chances of setting off loose wet sloughs. With no major concerns for weak layers in the existing pack the thing to watch is the accumulation of new snow and wind. The mountains have received about 3 inches of new snow in the last 24 hours and winds have loaded lee aspects more deeply. Look for weak layers between changes in density. More snow and wind forecast for tomorrow. Currently Crust on Surface with warming temps and snow today which could lead to loose wet slides on steeper terrain over 32 degrees on all aspects. Avalanche hazard is being held in check by the melt/freeze conditions from the last few days and nights. The pack is isothermal and there are no serious lingering weak layers in the upper 3 feet above the thick crust. New snow and warming temperatures will be your main concern later today and this weekend. Avalanche hazard is being held in check by the melt/freeze conditions from the last few days and nights. The pack is isothermal and there are no serious lingering weak layers in the upper 3 feet above the thick crust. New snow and warming temperatures will be your main concern later today and this weekend. Mid 20 temperatures at night have helped the avalanche danger. The snow pack is just barely seeing cold enough nights to keep it in place. Look for a weaker snow pack to develop quickly when temps warm up. Even though we've seen a lot of rain in the snow pack at 6000', temperatures at night have been cold enough to keep the upper portions of the pack mostly frozen. Rain has percolated through the pack about 60-90cm down. Temperatures in the mid 20's at night are helping keep the snow pack locked in place. If temps. warm up it could quickly become a different story. Melissa and MIiles found about 110cm of new snow since the rain 3 weeks ago. So far, it has all landed right side up and settling. Snowfall yesterday was already beginning to get denser as they were headed out. Concerns are windslabs in the N-NE-E aspects near and above treeline and the recent storm slabs. We've received about 1 foot of snow on the level since last week and steady westerly winds have piled it up even deeper on lee aspects. Warming temperatures with the most recent accumulation of several inches last night will have created an unstable situation at the surface, particularly in those wind-loaded areas. Touching off a small slab in steep terrain could step down to lower layers. MODERATE avalanche danger today for mid and upper elevations for the entire forecast region with isolated areas of considerable in steep exposed terrain near ridgetops on windloaded aspects N, NE, E. With increase in wind, snow and temperatures watch for heavier snow on lighter snow in the upcoming storms producing 1.5 feet of new storm snow weak layers. In the Bitteroots near Lookout Pass we have 3 feet recent storm snow which has a decent bond to the 8 inch icecrust from 3 weeks ago with some instability within the top 3 feet of storm snow due minor snow density changes between these storms. Things are starting to consolidate. The upper few inches of snow have some wind affect in most areas with more on steep exposed upper elevations. In the Cabinet Mountains near Lunch peak we found 9 feet of snow with calm winds and below freezing temperatures. Above the thick icecrust formed 3 weeks ago, we have received 3 feet of low density fluff with the top 3 inches starting to slab up from the recent winds since Wednesday. High avalanche danger exists across the forecast area. Travel in avalanche terrain is not recommended. Stay off slopes steeper than 30 degrees above the 4,000 foot elevation.